Owning a château is still a prerequisite for joining French high society, it seems. Here are the richest French winery owners on the latest France 500 rich list produced by Challenges magazine. It’s been an extremely busy summer in Bordeaux. Just in a few square miles on the limestone plateau of St-Emilion, we have had the Moueix family buying Clos de Magdeleine and Magnan la Gaffelière. Troplong Mondot exchanged hands for a reportedly record fee. The rumour is over €5 million per hectare, which blows previous St-Emilion prices out of the water. For Bordeaux, it’s a reminder not only that estates are being more and more concentrated into the hands of those with seriously deep pockets, but that château ownership is seen as an essential part of a respectable wealth portfolio. So no surprise that when the annual ‘500 Wealthiest in France list’ was published this summer by Challenges magazine, wine as ever plays a significant role. A full six in the top 10 names have interests in wine somewhere in France. Only Pierre Castel, at number nine, can be said to have actually made is his fortune in wine, and even that was via beer in his early career. Bernard Arnault of LVMH is France’s richest man. Credit: Wiki Commons. The wealthiest man in France in 2017 is Bernard Arnault, leapfrogging Liliane Bettencourt who took the number one spot in 2016. 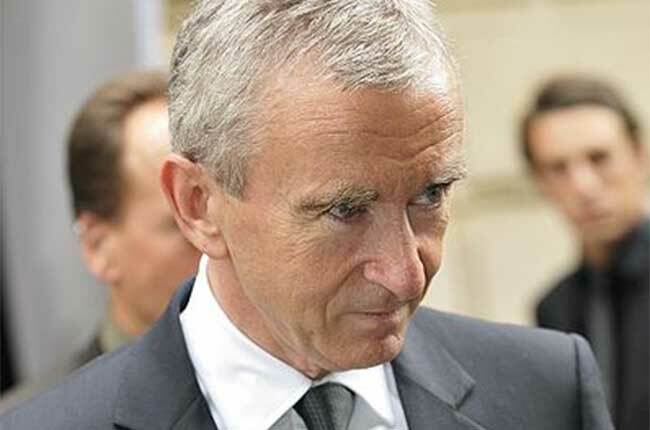 Arnault’s fortune stands at €46.9 billion and he is owner of LVMH, and through it Châteaux d’Yquem and Cheval Blanc, not forgetting Clos des Lambrays, Krug and his other Champagne houses. He’s had a good year, you’ll be happy to hear, with his net worth jumping by €5 billion in the space of a few hours back in March, when it was announced that he was taking full control of Christian Dior. Next up on the wine list is Axel Dumas and the Hermès family up on place to number three with €30.8 billion. You have to be a little acrobatic to make the link to wine here, as the Mommeja brothers of Château Fourcas Hosten in Listrac-Médoc are part of a separate branch of the sprawling Hermès clan. At number four we have Gérard Mulliez (€30billion) of the Auchan supermarket group (who apparently has made over 700 of his cousins millionaires due to his business acumen). With that many family members, you just know there is a wine connection in there somewhere – I found a great-nephew, Romain Mulliez, who is founder of La Vignery wine shops and importer of New World wines into France, but am sure there are other wine connections in there, so please correct me if you know of any. A clearer link for the next three, with Serge Dassault (€21.6billion) of aeronautics fame and owner of Château Dassault in St-Emilion at number five. He is followed by Alain and Gérard Wertheimer of Chanel – €21billion, with assets including Châteaux Canon and Rauzan-Ségla as well as St Supery in Napa. Then in seventh place it’s François Pinault and his Groupe Artemis, owner of Châteaux Latour and Siuarac in Bordeaux, plus Grillet, Eugenie and Eisele further afield, with €19 billion. Just a touch lower down the rankings comes the Bolloré family, down two spots to 12 this year with €7.7 billion. The family owns Domaine de la Bastide Blanche in Provence. Following closely is the Perrodo family at number 13 (€7.5 billion) of Châteaux Labégorce and Marquis d’Alesme. And just making it into the top 20 is Benjamin de Rothschild at 20 (€4.5 billion) of Châteaux Clarke in Listrac, des Laurets in Puisseguin St-Emilon and others in South Africa and Argentina. At number 25 the Moulin family of Galleries Lafayette (€3.5billion), newly in wine care of their investments a few years ago (helped by their long term friends Florence and Daniel Cathiard at Smith Haut Lafitte) in Châteaux Beauregard, Pavillon de Beauregard, Bastor-Lamontagne and Saint-Robert, all in the Bordeaux region. Unchanged at number 30, the Bouygues brothers (€3billion) of Château Montrose in St Estèphe and newly-announced owners of Clos Rougeard in Saumur-Champigny. The Hennessy and Chandon-Moët family (now part of LVMH) own in a personal capacity – through Philippe Chandon-Moët – Château de Ferrand in St-Emilion. The Remy-Cointreau family at 32, up five places from last year, has seen its fortune rise 20% to €2.9 billion. Clement Fayat is up five places also to 51 with €1.5 billion, owner of La Dominique and Clement-Pichon. Philippe Rouzaud of Louis Roederer at 108, down from 93, with 785 million. Philippe Sereys de Rothschild and family at 110, down from 88, with €775 million (to be fair, the family fortune remains unchanged, it is just that others have overtaken them). Bernard Magrez is at 130 with €650 million – Challenges states here that it incorrectly assessed Magrez’s wealth last year, having him in 94th place, and that this has now been ‘adjusted’. Corinne Mentzelopoulous of Chateau Margaux is also down from 103 to 135th place, because, according to Challenges, of the price drop for the 2013 and 2014 vintages. The magazine expects this to be rectified due to the prices of 2015 and 2016 you will be happy to learn. The Leflaive family of Domaine Anne-Claude Leflaive down at 478 with a still perfectly-respectable €140 million.